Meet the dedicated team that makes Gentle and Caring Dentistry – Maroubra Dentist such a great place! Dr Roxanne Irani (B.D.Sc) is a general dental practitioner and the founding dentist of Gentle and Caring Dentistry in Maroubra. Dr Irani has extensive experience in treating a range of dental aspects and concerns, including general dentistry, children’s dentistry, emergency dentistry, cosmetic procedures, preventive and restorative treatments and treatments under sedation. When treating her patients, Dr. Irani focuses on getting to know their concerns and ensuring that they leave her practice satisfied with the results. After completing her dental studies at the University of Melbourne in Victoria, Dr Irani began working as a dentist in county Victoria. She then gained further experience by working in India and Nepal, where she treated a variety of different dental problems, gaining tremendous experience and exposure. Her early work effectively prepared her to deal with any dental problem a patient may need treated, encouraging her to take on an especially gentle and caring approach. Dr Irani now has 17 years’ experience in delivering highly professional and effective dental care and treatments. 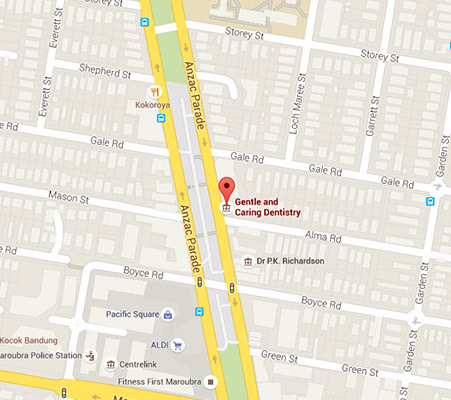 She has been running her successful dental practice, Gentle and Caring Dentistry in Maroubra. Dr Irani’s main focus includes the prevention of dental problems, like gum disease, to ensure her patients retain their natural teeth for as long as possible. By working closely with her patients to ensure their dental hygiene habits are effective, Dr Irani emphasises the importance of maintaining healthy teeth and gums to prevent the need for expensive dental procedures in the future. Her passion is to enhance her patient’s smiles and guide them in maintaining a healthy smile for a lifetime. Dr Irani believes in making her patients feel as relaxed and comfortable as possible throughout their treatments, using techniques like aromatherapy and soothing music for a more pleasant experience. She also employs sedation techniques for patients who tend to become anxious when faced with their dentist visit. Practising high quality, gentle and caring dentistry is Dr Irani’s philosophy. Her relaxed and caring nature is what helps to set her apart from other dentists.